Why your business needs Google Remarketing image Ads! Don’t let your customers forget about you! Google Remarketing image ads give your business the ability to continue to showcase your products to people who’ve previously visited your website…on other websites. Have you ever visited a website and then found soon after that their advertisements have started to follow you around? It’s not a coincidence! Chances are they’re using Google Remarketing image ads. Google Remarketing image ads are a form of reminder advertising – and they’re a great way to remind customers about your product offering, long after they’ve visited and left your website. Technically speaking, when people leave your website, a “cookie” is attached to their browser. Because of this “cookie,” your ads – if set up correctly – will follow them around for a few weeks. This gives your the ability to stay relevant whilst the customer makes a decision about which company’s product or service they end up buying. So who is it going to be? Yours or your competitors? If you’re not investing in Google Remarketing, chances are that your competitors are. But why should I use Google Remarketing? Google Remarketing image ads can be effective and a great driver of additional revenue for your business. And if you’re capturing those extra sales because of these banner ads, then what do you have to lose? 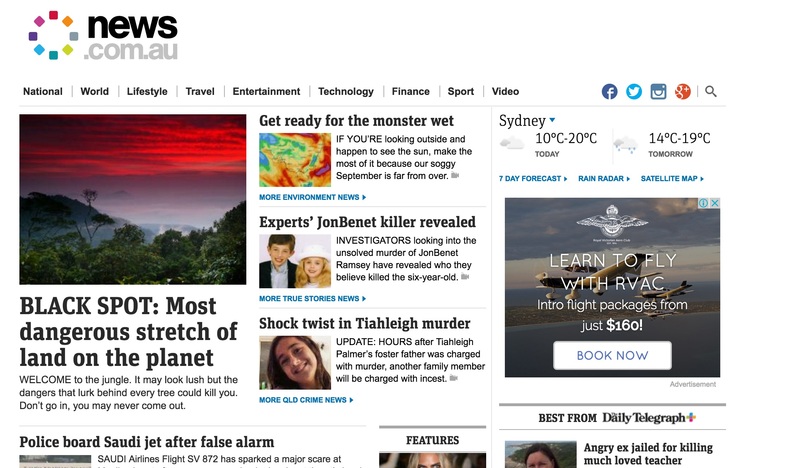 Notice that after visiting the site, this ad will appear on well-known websites such as news.com.au. This could be your business on display. Imagine the possibilities! There are many benefits for your business online marketing model. Whether you’re looking to drive sales activity or promote your brand awareness, remarketing is an increasingly vital component of your strategic online advertising. It can and if set-up correctly drive a return on investment (ROI) for all types of business advertisers. Webtron can set this up so you only pay when somebody clicks your ad. Access to people when they’re most likely to buy: Chances are, that when people are visiting your website, they’re not going to buy on the spot. They’re going to go away and think about it. With Google Remarketing image ads, you have the option to reach people after they’ve interacted with your business… And whilst you’re still fresh on their minds. Let’s face it. If they have been to your website, there’s a strong likelihood that they are interested in what you have to offer. You need to get aggressive and get back on their radar. So your brand is the one they are thinking of when the buying decision is made! This could be when they’re searching for your product, visiting other websites and using other mobile apps. Tailored lists to your advertising goals: Customise your remarketing lists to achieve specific advertising goals. For example, you can create a “Shopping basket abandoners” list to show ads to the people who added something to their shopping basket but didn’t complete a transaction. Efficient pricing: You can create high-performance remarketing campaigns with budgeted pricing spend. Image and video Ads: Webtron produces professional multiple text, image, logo and video ads. These ads can really stand out from the crowd and provide the best “bang-for-your-buck” brand awareness to a potential client you will ever get*. Insights into your campaign: You’ll have reports of how your campaigns are performing, where your ads are showing, and what price you are paying each time somebody engages with your ad. Reach your customers when they’re searching for you: Show ads to previous visitors who are actively looking for your business on Google Search. Standard remarketing: Show ads to your past visitors as they browse Display Network websites and use Display Network apps. Dynamic remarketing: Boost your results with dynamic remarketing, which takes remarketing to the next level. Dynamic ads include products or services that people viewed on your website. Talk about targeted advertising! These can be quite effective because they reflect the exact products a customer has been looking at. You’re reminding them not only about your brand, but the product they’re after as well! And that means fewer clicks to get to the shopping cart. Talk about a quick buy! Remarketing for mobile apps: Show ads to people who have used your mobile app or mobile website as they use other mobile apps or browse other mobile websites. Remarketing lists for search ads: Show ads to your past visitors as they do follow-up searches for what they need on Google, after leaving your website. Video remarketing: Show ads to people who have interacted with your videos or YouTube channel as they use YouTube and browse Display Network videos, websites and apps. Email-list remarketing: With Customer Match, upload a list of email addresses that your customers have given you. You can show these customers ads when they are signed in to Google Search, YouTube or Gmail. Why wait any longer? Contact Webtron to see how we can assist you with tailored re-marketing ads for your business.